The Pathology and Lab Medicine (PALM) domain of the Integrating the Healthcare Enterprise (IHE) organization has collaborated with DICOM (Digital Imaging and Communications in Medicine) working group 26 to propose an initial draft solution supporting an environment of interoperability among vended digital pathology instrumentation and systems focused on acquisition of digital assets critical for anatomic pathology diagnostics. Digital imaging in anatomic pathology typically spans two primary aspects of the conventional workflow, notably the gross / macroscopic examination and the histologic / microscopic examination. Currently there is minimal formal literature that speaks to optimal interactions amongst vended solutions. This gap might be filled through documentation of precise descriptions of how best to accommodate the requirements of the most prevalent requirements within the market. Whole slide imaging (WSI) has the potential to (and likely will) reinvent the processes in the anatomic pathology laboratory information systems (AP-LIS). The advent of WSI technology is a catalyst for change. The authors propose a set of systems (actors) and critical activities (transactions) that will help facilitate interoperability and value of vended digital pathology solutions including the AP-LIS, image scanners, and image archives/PACS. This effort represents an important beginning of a long-term collaboration. There is more to digital pathology than just supporting WSI and associated instrumentation, although it is noted that this innovation is a catalyst for change and has enabled a significant evolution of workflow and advancement of the field. Identify the role of international interoperability initiatives that will help digital pathology vendors partner together to provide robust solutions for all customers. Describe the important aspects of a digital pathology workflow that require close collaboration among vendors of instruments and software. Consider how different vended components of a holistic digital pathology workflow benefits from adoption and adherence to interoperability standards and initiatives. 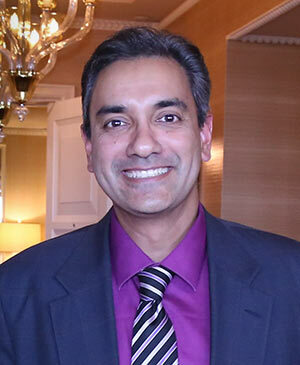 Raj Dash is a co-chair of IHE Pathology and Laboratory Medicine. He is a pathologist at Duke University with training in Cytopathology and Informatics. He currently serves as the Beaker physician champion and the Medical Director for Laboratory Information Systems as well as the Director for laboratory informatics strategy for Duke Health Systems. He is involved in the research and development of medical terminologies and associated software tools for medical data mining and analysis. He has participated as a platform for “caTissue Core” and represented the National Library of Medicine as a member of the Technical Committee on SNOMED International. He served as chair of the International Pathology and Laboratory Medicine Working Group within SNOMED International and currently participates in the ONC Laboratory Reporting TIGER Team. He is active on a number of national committees serving the College of American Pathologists, including the Informatics Committee and the Board of Governors.